As a homeschool mom I’ve been intrigued with the Charlotte Mason method of teaching for a while. I’ve always been too nervous to try it out in fear of not having a schedule or a manual to follow. I was thrilled when my friend Stephanie (The Multi Taskin Mom) asked me if I’d be interested in reviewing a Charlotte Mason writing program. I was given the opportunity to select the level and historic time period book I wanted to complete our review. My son and I both like learning about Ancient History, so I decided that is where we would like to start with this program. The writing program, “Write From History” is written and designed by Kimberly Garcia from Brookdale House. The curriculum is divided into two levels. Level one is designed for 1st-3rd graders, and level two is geared towards 3rd-5th grade students. Both levels include 4 historic time periods; Ancient History, Medieval History, Early Modern History and Modern History. Manuscript and Cursive models of all books are available as well. The differences between the levels are found in the passage reading difficulty and the writing models. Level one’s writing models include two different style copywork layouts. The first model has copywork lines directly below each phrase and the second has the lines beneath the entire copywork passage. Level two has three writing models. The first has the copywork lines directly beneath the passage. Model’s two and three are on the following page. Model two can be used with an additional reading selection found in the appendix. The final model is given for the students that are not yet ready for dictation, so they can complete additional copywork if you so choose. This curriculum is based on reading selections from history. From narratives to poetry, cultural tales to Aesop’s Fables, you and your children will be reading and learning throughout great literature passages. Within the Ancient History program there are Biblical alternatives for the passages that include ancient religions and/or pagan gods. The copywork passages are adapted from the day’s reading selection. You can also choose to use the additional copywork models found in the appendix or create your own. Kimberly includes a simple color coded grammar study and you’ll find the instructions for it’s use within the appendix. Each part of speech is identified by a circle which is drawn around the word with a particular color. Nouns are circled with blue, verbs with read, etc. I loved that this program included directions, schedules, examples and more to use throughout your reading, oral narration, written summarization, copywork, grammar and studied dictation. For a first time Charlotte Mason teacher this was essential information for me. The only drawback for me is that there is not an answer key included for the grammar part of the program. I know most Charlotte Mason teachers do not feel the need to use one, but when I’m striving to teach my children grammar, I want to ensure I’m not missing anything within the reading selection. 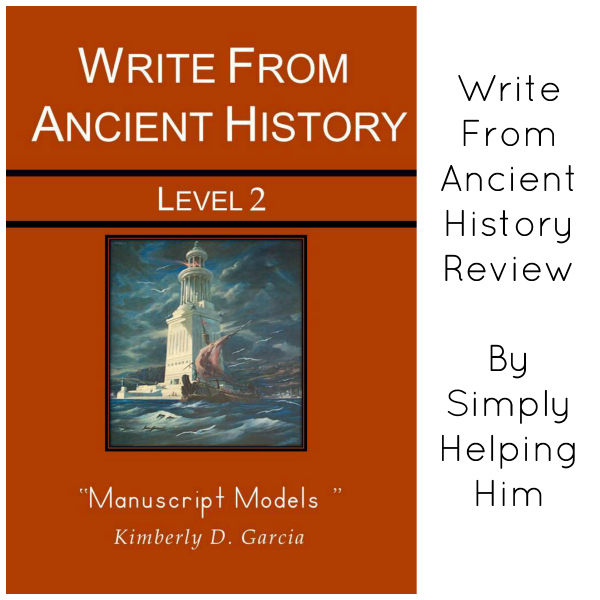 I hope you’ll stop by the Write from History website to explore, for more information or to grab your own copy of this great writing program!